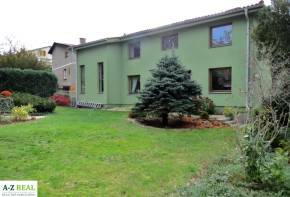 Family house, Hrebendova, Rent, Bratislava - Staré Mesto, Slovakia - A-Z REAL spol. s r.o. Rent a 2-storey family house situated on Børik on Hrebendova street. The house is 5 rooms, sunny and provides maximum privacy, utility area 240 m2, land 600 m2, garage + 1 parking space on the land, house is rented unfurnished, wardrobes in the bedroom and in the hall, satellite, on the lower floor outside blinds, on the floor interior. Layout: On the ground floor there is an entry hall, open living room with fireplace and fully equipped kitchen, work room that can be used as a guest bedroom, bathroom with shower and toilet. On the first floor there is a hall, main bedroom with its own spacious bathroom, 2 additional bedrooms, bathroom with shower and terrace. The basement consists of 3 rooms. The house is in a quiet location with excellent accessibility a 5-minute drive from the historic city center and the motorway bypass. Rental price: 2 500 EUR + energy. Available from 1.5.2019. Contact the real estate agency.